Your friends and family may understand you are not the best of drivers. Deep in your heart you may have come to accept that perhaps you are not the best person when it comes to keeping your car maintained properly. But do you know who else knows? Your mechanic. Just by taking a walk around your car and making some observations your mechanic can tell what kind of a driver and owner you actually are. Here are just some of the tell-tale signs. The outside of your tires have no discernible markings. While most tires have raised lettering or even white rally writing on the sides, if yours are scraped off, your mechanic knows you may have an issue with curbs and parking. You just may be parking more by “feel” than sight. Your car’s four quadrants have dings. Front left, front right, rear left and rear right, your car has met with something. 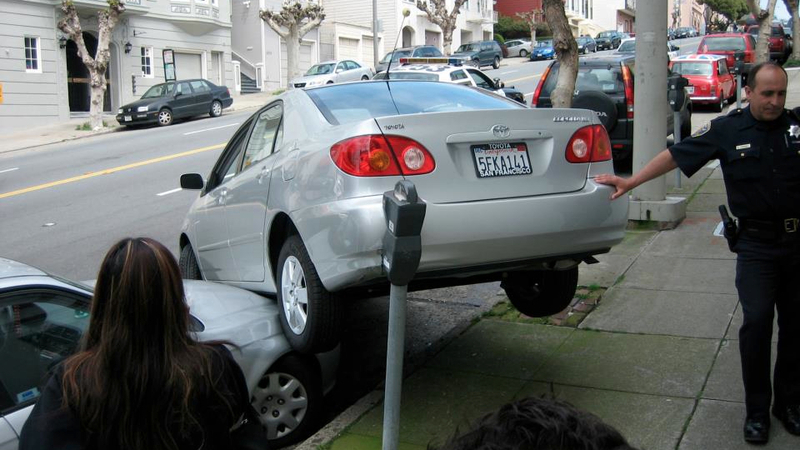 The more dents, the better the indication you perhaps should let someone else drive…at least drive more often. Your oil is black and stinky. If your oil is midnight black and has a distinctive odor about it, you probably aren’t paying proper attention to it. Oil and filters are designed to be replaced once in a while. If you just add “fresh oil” when your level gets low that is just not good enough. You mechanic will know what you are doing. Your mechanic has a “Customer of the Month Award” and you have won three consecutive months. Other indications are he knows your middle name, sends you a Christmas card, or says “See you next month” when you leave. There are fingernail marks on your dashboard. If there is a worn spot on the carpeting on the passenger’s side in the car where passengers have been pushing imaginary brakes or if there are fingernail marks in your dashboard, you might be a bad driver. You tell your mechanic “My brakes sound like they are grinding”. Your brakes are designed to squeal as a warning that they are wearing thin. This is to prevent more expensive repairs like replacing entire rotors. If you ignore this squealing, that sound will likely soon be replaced with a gradually increasing grinding metal sound. Your mechanic will know you ignored that squealing sound. Your radiator is filled with clear liquid. Yep, he’ll know that liquid is water. That means there has been no effort to give your cooling system a helping hand. You see coolant or anti-freeze serves multiple purposes. It improves the heating/capacity of your system, it works as a rust inhibiter for your cooling system, and it helps maintain the connections between hoses and clamps and keeps the hoses flexible. Just adding water to a cooling system will eventually dilute it to the point where it offers little protection. You have made use of duct tape, plastic sheets and red tinted plastic to make DIY car repairs. Hey, you gotta do what you gotta do but if you have multiple car widows covered with plastic using a roll or two of duct tape and a baggie spray painted red over a rear taillight, you mechanic may get an indication of how you treat your car. Just sayin’. Your mechanic has likely seen it all. They have been asked to “do what it takes” to get a vehicle to another 100 miles, and they have diagnosed cars that have shocked them are still even running. Taking care of your car is a good investment that more drivers need to make. It is not unlike improving your defensive driving skills. Did you know that an online traffic school can potentially save you money on your car insurance or even get points reduced on your driver’s record? It is like some secret like-hack to improve your on the road experience.